Understanding the Behavioral Healthcare Crisis is a necessary book, edited and contributed to by a great variety of authors from academia, government, and industry. The book takes a bold look at what reforms are needed in healthcare and provides specific recommendations. Some of the serious concerns about the healthcare system that Cummings, O'Donohue, and their contributors address include access problems, safety problems, costs problems, the uninsured, and problems with efficacy. 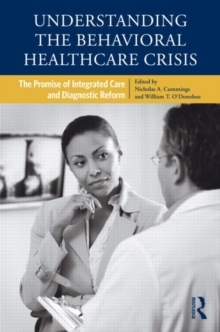 When students, practitioners, researchers, and policy makers finish reading this book they will have not just a greater idea of what problems still exist in healthcare, but, more importantly, a clearer idea of how to tackle them and provide much-needed reform.